Yeah, seriously. We were surprised too. 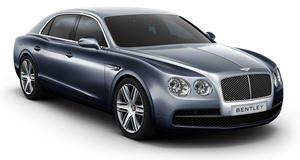 We’re interested in any car that’s big, bold and brash, and Bentleys, in general, fit that description perfectly. So imagine our delight when we were invited to check out the new 2017 Bentley Flying Spur V8 S. It’s like the "regular" V8 Flying Spur, only more powerful and featuring optimized electronic stability control, a re-calibrated damping system, and a few exterior and interior styling tweaks. Speaking of V8s, the Flying Spur V8 S is powered by a twin-turbo 4.0-liter V8 with 521 hp and 502 lb-ft of torque, with power going to all four wheels through an 8-speed slushbox. What’s cool about this AWD system is that it has a 40/60 percent power bias to the front/rear wheels. Performance is a blistering fast 0-60 time of 4.6 seconds, and top speed is 190 mph. Yes, in a 5,300-lbs sedan. Now, we previously reviewed the Flying Spur with the batsh-t crazy twin-turbo W12 and its 616 hp and 590 lb-ft of twist output. Yes, it may hit 60 from a standstill in just 4.3 seconds and maximum speed of 199 mph, but here’s the thing: that sucker is even heavier, tipping what could also be used as an elephant scale at 6,500 lbs. Point being, weight also affects handling, and because of that huge factor alone, we think the new V8 S is the sweet spot in the Flying Spur lineup. You get all of the exuberant luxury of the W12, nearly identical performance numbers, and a better overall driving experience. Special thanks to Los Gatos Luxury Cars for letting us film the car.